Please click HERE to view the article! Francois Anton is an Algerian born artist that is currently living and working in the South of France. With a thirty-year-old career in painting, Anton has been recognized internationally and has shown work in several prominent art fairs and galleries in France, Switzerland, Germany, and the US. Anton uses his artwork to convey his sharp playful sense of humor. Raconte moi l'ocean oil on canvas 28 3/4" x 36"
In Raconte Moi L’Ocean, Anton balances several elements in the composition that visually and conceptually contradict one another in order to convey the possible coexistence of childhood and adulthood in modern life. For example, though the male subject wears formal business attire—slacks, tie, and a button up shirt—he is comfortably seated with a slight hunch, and with his sleeves are rolled up. He leans towards the fishbowl with unexpected curiosity. The painting is further divided between subdued and vibrant color palettes, as the primarily gray and brown canvas is interrupted with a bright blue back wall. However, with the Anton’s skilled hand, the many contradictions live in perfect harmony with one another and create an overall balanced composition. The title of the piece, Tell Me About the Ocean, suggests that as the man leans in towards the fish, he waits for a story to be told. The bright background, not so coincidentally blue like the ocean, and suggests that the man's curiosity for the fish’s past life has illuminated the subdued, monotone atmosphere. With a fusion of serious and playful elements, Anton proposes that the two can coexist and brighten an otherwise mundane modern world. L'education particuliere oil on canvas 36" x 28 3/4"
L'Education Particuliere, in English, The Strange Education, presents a man that is encouraging his cat to chase down a toy mouse. He wears the same attire as in the previous painting, and with the same casual composure. The gestural brushwork accentuates his enthusiastic body language as he hunches over, bends his knees, and waves his arm towards the teetering toy. However, his skin and clothing are rendered with soft, delicate lighting and detail, softening his otherwise abrupt motions. The composition is filled in with a dull gray and brown palette and is contrasted with a bright yellow rectangle of color. Anton continues to visually balance contrasting elements to suggest that the serious and the playful, adulthood and childhood, can coexist to create an enchanting, illuminated environment. Le Navigateur Solitaire, The Lone Navigator, illustrates a dog and a man, both looking at a paper boat in the water. The soft, blue green color palette is disrupted by pockets of bright red and yellow green. Though the subjects aren’t in motion, the gestural brushwork seems to activate the space, creating a restless, energetic environment. The paper boat is rendered to be the brightest part of the canvas, and thus commands immediate attention from the viewer. It’s so bright, in fact, that it seems to illuminate the space and cast a shadow behind the man. As the paper boat becomes the center of attention, the viewer inspects it, as do the man and the dog. The title suggests an element of childlike fantasy as it encourages the viewer to imagine a much smaller man inside the boat, navigating the waters on his own. Therefore, not only does Anton represent an intersection of childhood and adulthood through the combination of contrastingly playful and serious elements, but he also encourages the viewer to disrupt their own modern, adult life to practice their imagination. Francois Anton’s extensive body of work presents a unique perspective on our modern world, and how we choose to live in it. Each painting proposes the potential luminosity and lightheartedness that a child-like imagination and playfulness can provide. Francois Anton’s work will be on display this coming fall in our Boston Gallery. They’re intelligent, thought-provoking, and beautiful to look at. Be sure to stop by to see them for yourself! Visitors often do a double take when they walk by Beth Carter’s new sculptures that we currently have on display in our Boston gallery. Carefully crafted with an acute attention to detail, her work is visually beautiful. However, this beauty runs deep as the work is further enriched with layers of meaning and symbolism, left for the viewer to unpack. Carter’s sculptures emit an unarguably dark and mysterious quality. “Broken Carnival” is one of such pieces in which each of its three subjects, a man and three horses, display expressions of ferocity, and power. The man, with a stiff and hunched posture, fervently looks into the distance. The artist pays careful attention to the details on his body, whether they be strains in his neck, or wrinkles stretching along his face. These details, though minimal, are enough to convince the viewer of the man’s powerful distress. The artist applies the same specificity to the horses as well, though to communicate a different expression. The texture of their skin is rough and uneven, and their anatomical parts are stripped of any indication of emotion. Their eyes, for example, are hollowed out with a directionless gaze. The eerie, haunting horses, juxtaposed with the man displaying such strong emotions, creates an interesting tension within the sculpture and conveys a mysterious relationship between its two components. “Monkey and Horse” is another new piece in Carter’s collection, illustrating a strange and intriguing relationship between two animals. 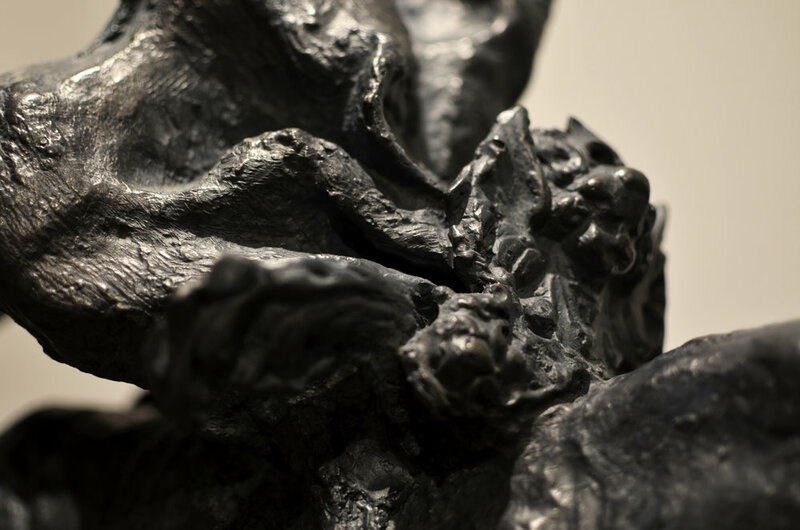 With the same treatment of material as “Broken Carnival”, the sculpture’s rough and textured surface seems to contribute to the chaotic tension of the composition. As the horse is falling to the ground, the monkey sits calmly on top of it, with its long, dainty tail wrapping around the horse’s flank. The stark contrast between the body language of the two animals introduces another strange relationship into Carter’s new body of work. Both of the represented animals, with their eyes hollowed out, demonstrate a curious indifference towards one another. Though the monkey stares directly at the horse, its strangely calm demeanor is incongruous with the horse’s panic. Carter incorporates mythological creatures into another one of her new pieces titled “Pegasus”. Carter’s work starkly contrasts the common depiction of the fictional Pegasus as powerful and liberated, often symbolizing freedom because of its ability to move on land and in air. She instead presents her subject as tired and distraught. Its legs seem disjointed, moving in all different directions. Its wings, shaped like a piece of fabric, seem to catch the wind and pull against the creature’s body. The tension of this piece lies between the Pegasus’s anatomical parts, each functioning independently of one another. This piece, though rendered with the same rough surface as the previous works, stands apart because the compositional tensions can now be observed in a single subject. Beth Carter often works with both human and animal form, integrating the two into a single composition or body. These combinations are often inspired by classical mythological creatures and stories. 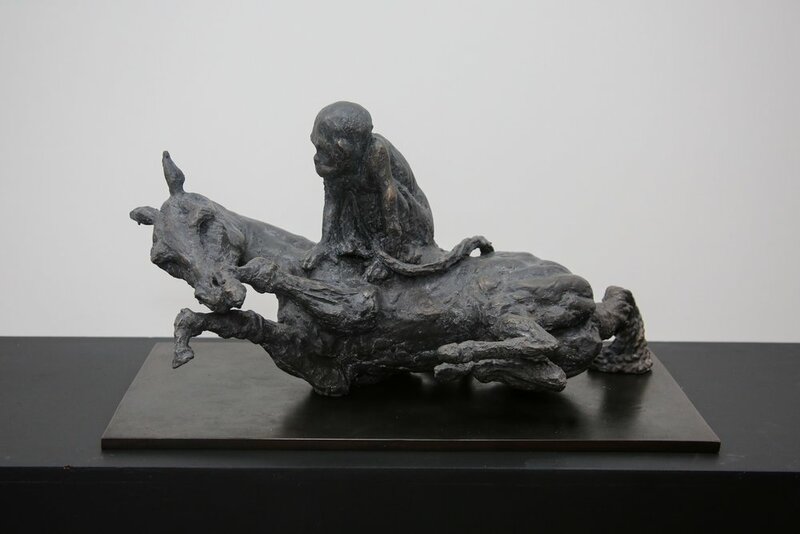 However, Carter connects the traditional practice of bronze casting and the traditional sources of mythological narratives to timeless concepts. She explores the idea of subconscious imaginings, and performance of gender and personhood. Carter draws from past technical and inspirational sources in order to communicate universally important ideas. All three of these pieces are currently on display in our Boston gallery. Be sure to stop by to take a closer look—sculptures always look better in real life! M Fine Arts Galerie has opened a pop-up gallery in Palm Beach for the 2017 winter season. The new gallery joins a distinguished group of sophisticated merchants—from stylish boutiques to elegant fine dining—in the heart of the charming Worth Avenue shopping district. 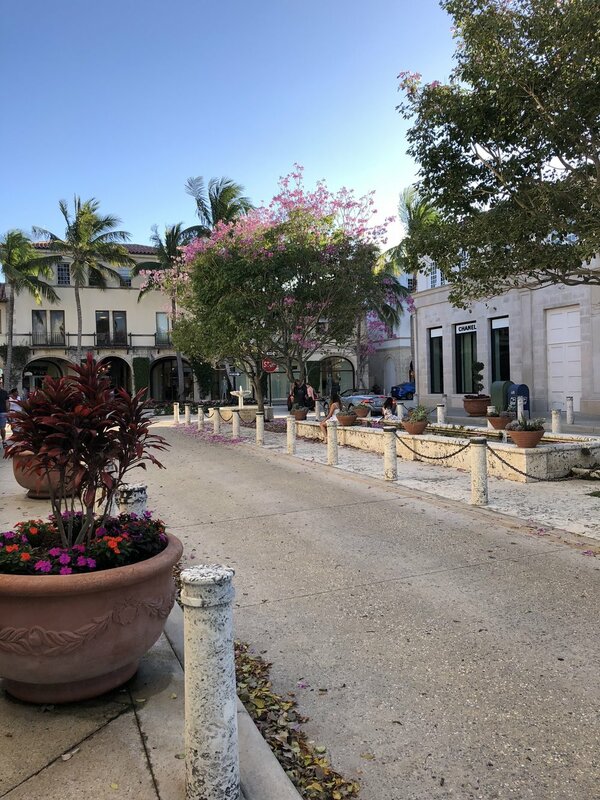 In joining the magical community of Palm Beach, M Fine Arts now has the opportunity to expand the reach and impact of its remarkable cadre of artists in a luxurious tropical enclave. We have brought exquisitely graceful sculptures of Chantal Lacout, bewitching dreamscapes of Eric Roux-Fontaine, and other various works by French artists including Michel Delacroix to the Palm Beach gallery. The gallery is also excited to introduce two new artists, Jeannie Motherwell and Aristotle Forester. Jeannie Motherwell, the daughter of Robert Motherwell and step-daughter of Helen Frankenthaler, was born and raised in New York City. Just like her parents, she developed a passion for abstract painting. She studied painting at Bard College and Art Students League in New York. She is currently on the Advisory Board for Both Cambridge Arts and Joy Street Artists Open Studios in Somerville, MA. Her painting process is very unique and the physicality of it is essential to her as an artist. One can sense the intimacy and immensity to the space in her work. She is deeply inspired by images and mysteries of the oceans and skies in changing weather and Hubble-type images of the universe. The painting process requires a lot of movement including pouring, pushing, and layering. Motherwell’s process allows her to explore spatial complexities and create unexpected moments in her work. She considers her work an ‘event’ or ‘occurrence’. Visitors to the Palm Beach gallery will be met with a trove of international treasures, such as Jeannie Motherwell’s unique abstract works, and a tasteful, welcoming atmosphere—all while enjoying sunny skies and refreshing ocean breezes. M Fine Arts invites you to join them in celebrating this new venture. The final test of a painting, theirs, mine, any other, is: does the painter’s emotions come across? If emotion is the primary aim of painting, then Joseph Adolphe tackles the heavy-hitters. Stunning as they are, Adolphe’s dramatic compositions, gestural brushstrokes, and saturated palette tout more than mere visual appeal. The upcoming October exhibition of his new works at M Fine Arts Galerie promises both optical pleasure and emotive punch. His paintings transcend art’s decorative function, serving instead as precious records of universal human struggle, welts left behind by the blows of inner turmoil. The technical and stylistic confidence of Adolphe’s creations belies the existential uncertainty that informs their conception. The simmering fluids of anxiety, frustration, and doubt come to a boil on the surface of Adolphe’s canvases. The intensity of the work’s physical execution is palpable. Just as Adolphe’s finished canvases viscerally acknowledges the act of painting, the content of his work emphasizes process over product, exploring the underlying forces of the material world. As much as Adolphe’s canvases command attention, they also merit time. The viewer of Toro Bravo no. 38—or any of Adolphe’s bull series, for that matter—is greeted first by bravado, forcefully confronted by the bull’s impressive scale, threatening stance, and fervid execution. After several moments of marination, however, the work’s macho impact begins to unravel and evolve, softening and giving way to a more complex portrait of personal power. The slashes of paint comprising the bull’s immense dark form crash and bleed into another, gorily melding the beast with his hazy blue surroundings. A pair of eyes—large and unexpectedly doleful—prompt the viewer to contemplate the bull’s uncertain fate at the hands of a brutal toreador. In both subject matter and technique, the artist strikes a precarious balance between solidity and fragility. 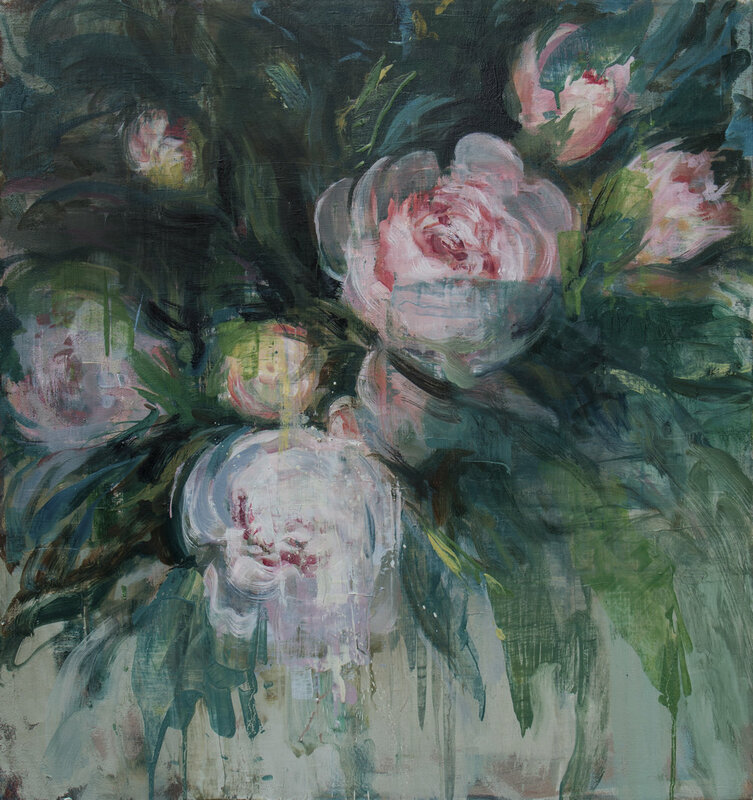 Sugary pink blooms peek out from a shroud of dense greenery in Peonies no. 2, while plump golden fruits dangle enticingly from the lush branches of The Orange Tree. Dripping with pigment and juicily executed, Adolphe’s fruit and flowers alike appear moments away from melting off the surface of their canvases. In a nod to 17th-century Dutch memento mori still life traditions, Adolphe reminds us of the bittersweet brevity of nature’s treasures. A yellowed skull swathed in crumpled white paper rests on the shelf below a ripe orange bouquet in Still Life no. 9, enhancing the impact of Adolphe’s subtle references to life’s essential transience. Adolphe’s work covers a refreshingly wide swath of subject matter. The marked fluidity with which the artist transits between diverse content and genres speaks to the potent universality of his deeper interests. 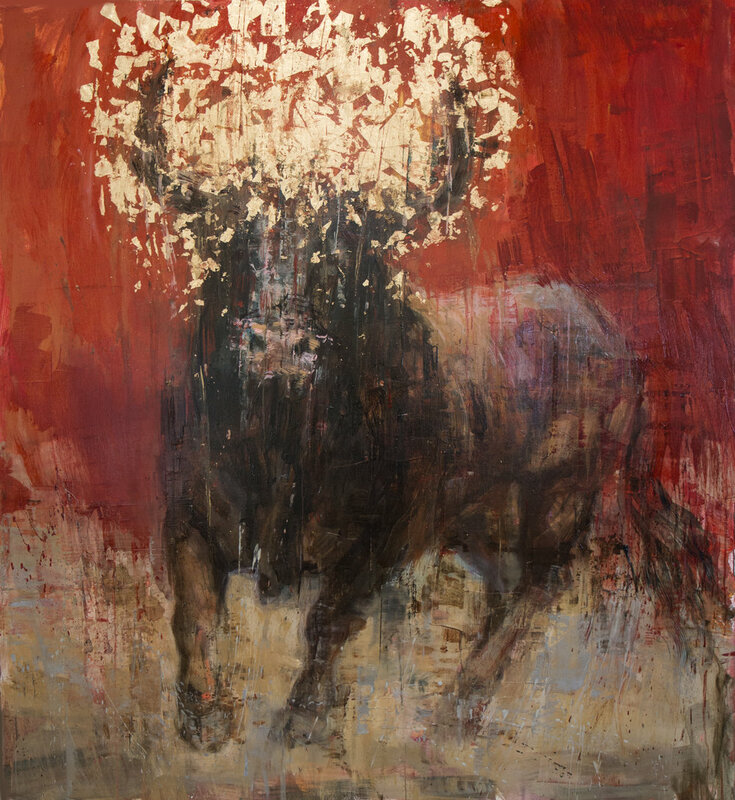 Themes of rebirth and resilience serve as connective tissue, easefully stringing together subjects as seemingly disparate as bulls, flowers, and dishes. The technical strength and emotional authenticity of Adolphe’s work has not gone unnoticed. Since 1998, his paintings have been featured in over forty exhibitions internationally and are held in numerous private and corporate collections. Adolphe has been the recipient of several awards, including the first place prize in the 2010 “Figure Now” competition at Fontbonne University in St. Louis, Missouri. In the summer of 2012, his painting Mars No. 1 was chosen for the cover of Manifest Gallery’s exhibition-in-print, International Painting Annual. Originally from Calgary, Canada, Joseph Adolphe moved to New York City in 1992 to attend the School of Visual Arts, where he received his MFA in 1994. Adolphe now lives with his wife and children in New Haven, Connecticut and is a professor of Fine Arts at St. John’s University in New York. To learn more about the artist and his work, visit his website or check out the trailer for HEAVYWEIGHTPAINT, a 2016 documentary following Adolphe and three other painters working in Brooklyn, New York.